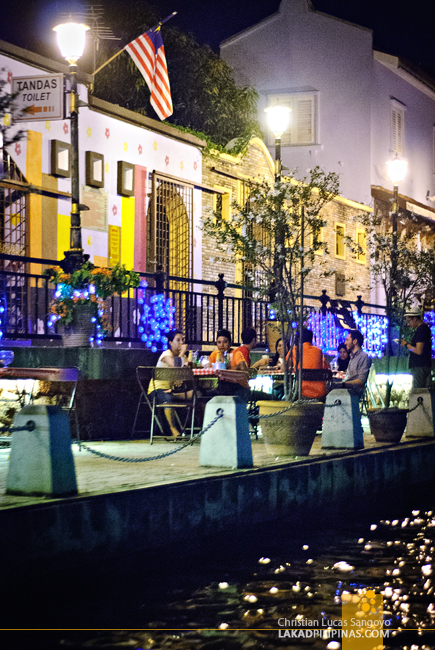 MALAYSIA | The Melaka River Cruise, Worth It? 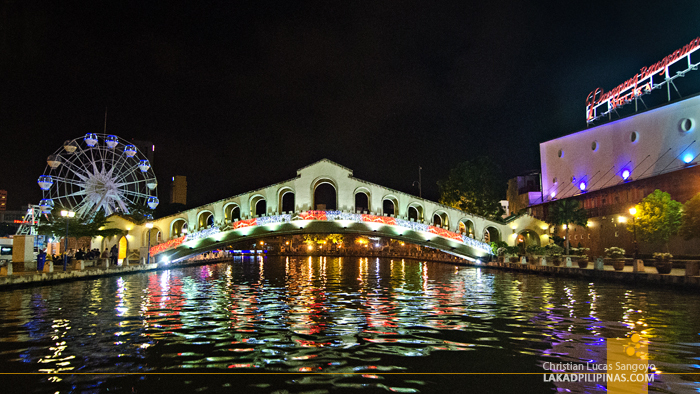 Our boat leisurely cruised along the dark sparkling waters of Melaka River. On the background, our guide spoke languidly in Malay. I turned to my companion and flashed a confused look, this was supposed to be a historical tour, but I couldn’t for the life of me, understand a single word being uttered. It was our first night in the city and after checking in at the Imperial Heritage Melaka, we immediately headed to the Spice Garden with F, our newfound friend from Malaysia. We were not there to eat though, what we were there for was a boat cruise. SELFIE FIRST, THEN WE’RE READY TO GO! I’m not really a fan of boat tours, having ho-hummed my way through one in nowhere less than Amsterdam, but I was ready to try it out since I was too shy to say no to F, who fetched us all the way from our hotel just to take us here. 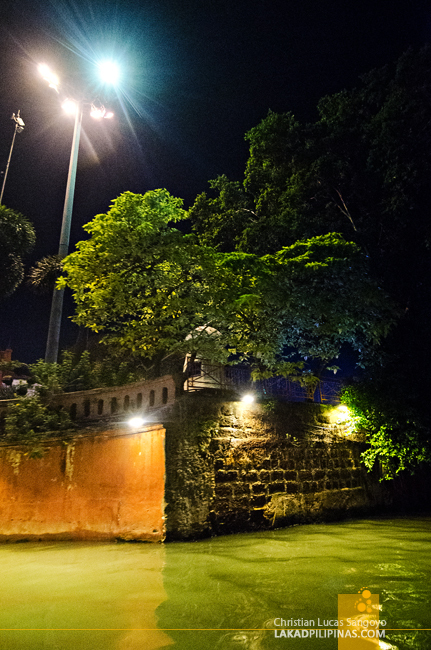 So to the Melaka River Cruise it was. Chagrined, we bought our tickets, boarded our boat and were soon floating off the Melaka River faster than I can say, can’t we just eat mee goreng? 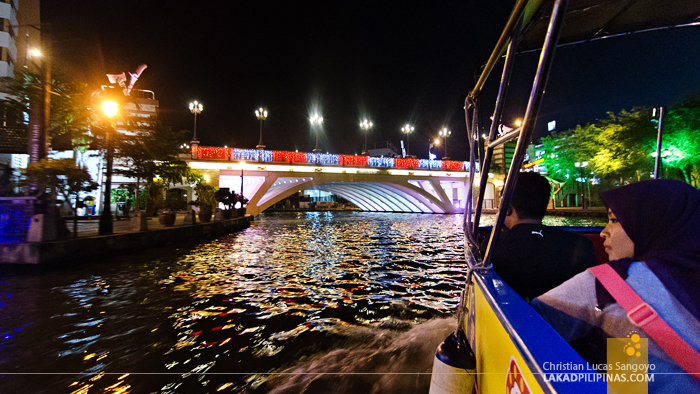 The sights of the city loomed into view as our boats revved across the water. It was nothing spectacular though; lighted skyscrapers, the river, some decorated bridges, the river, the river and more of the river. 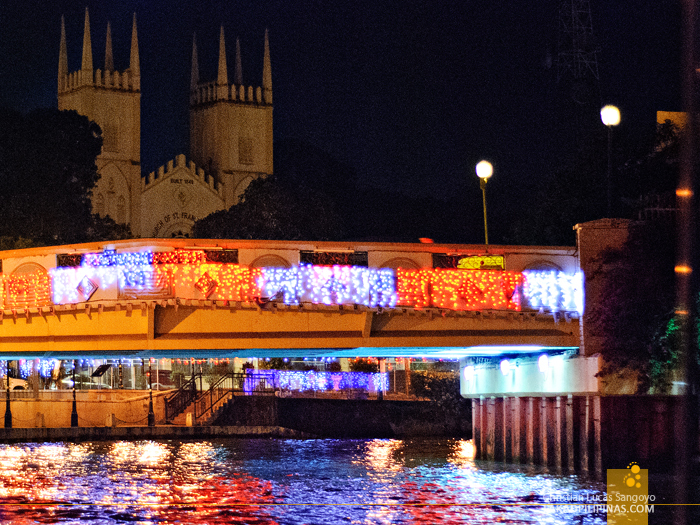 And then it started to get quite Disneylandish, the lights and bridges begun to get kitschier. Then a Ferris wheel sprung into view. Oh man, what did I just get ourselves into. This would be a good ride for kids though, I thought to myself, fearing I’ve just wasted a few ringgits from our now dwindling ASEAN Summer Loop travel budget. I was almost ready to throw in my towel and declare the river cruise a total waste of time and money when we turned a corner and emerged on a row of colonial houses lined with cafes. It was so quaint I immediately imagined myself and my buddy having a few bottles of Tiger beer at that same spot. I wanted right then to switch positions with those people, but things were just getting a bit more interesting. 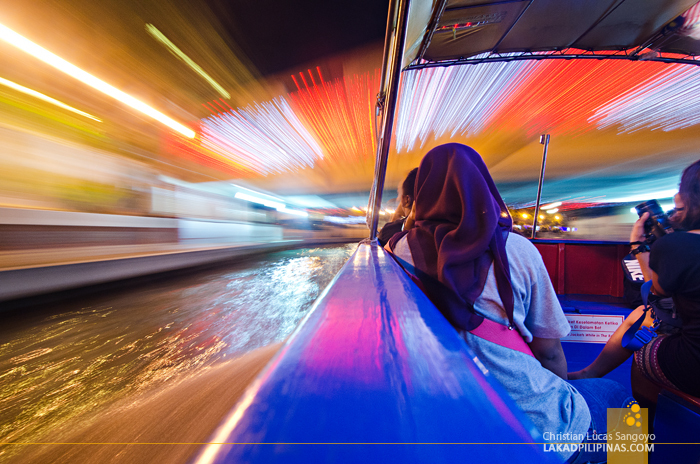 The Melaka River Cruise lasts for about 45 minutes, covering a distance of about 5.5 kilometers. While our starting point was at the Spice Garden, it also has another one near the Maritime Museum. 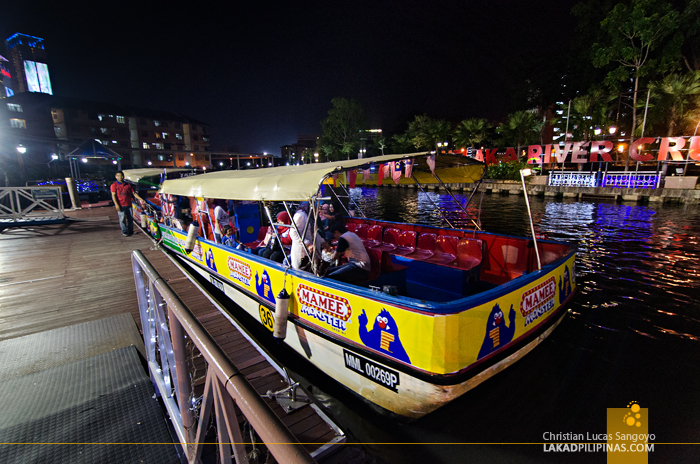 Each boat carries about 20 to 40 passengers, but only a minimum of eight is required for it to depart. The channel got narrower and indeed the sights became much more interesting. We saw old houses and theaters, some churches and residential areas filled with beautiful architecture. I was now wishing we’d done the cruise on an earlier time since I was having a hard time capturing the scenery with my camera. 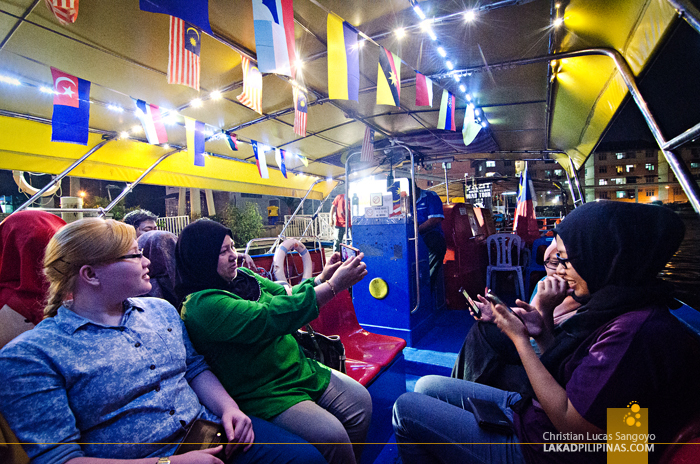 Our host, however, said that it’s actually nicer to do the Melaka River Cruise at night since it gets dehydratingly hot in Melaka during the day. Well, I couldn’t agree more with her, as we experienced that ourselves the next day. I guess the best time to do the cruise is during sunset. 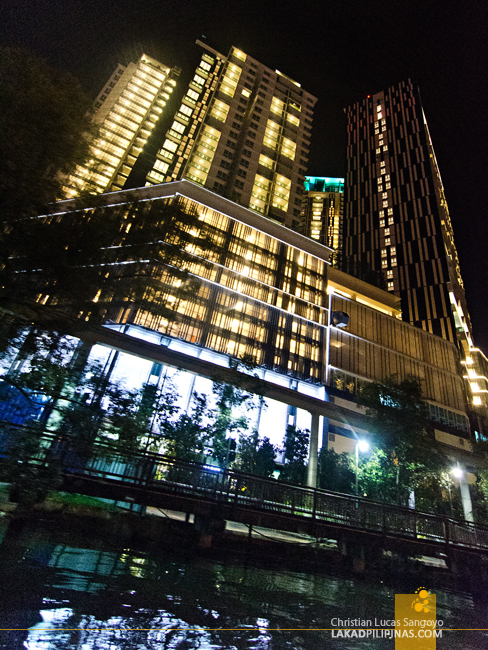 But again, we didn’t have that luxury as we have to catch the bus back to Kuala Lumpur by that time the next day. The tour was actually a good first activity while in Melaka as it is a nice overview on what to expect and see while in the city. 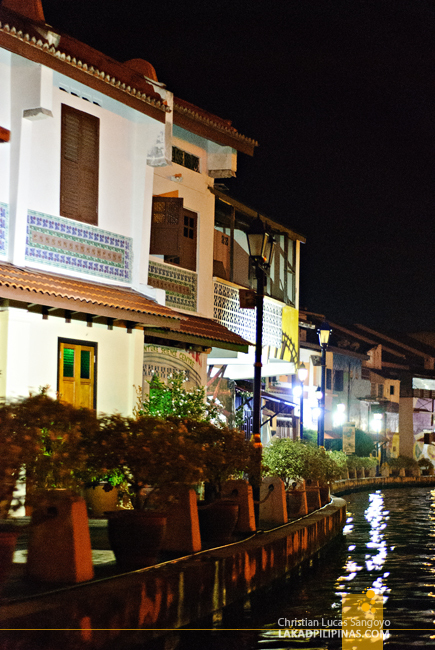 To be honest, it did make us want to stay a few more days in Melaka. 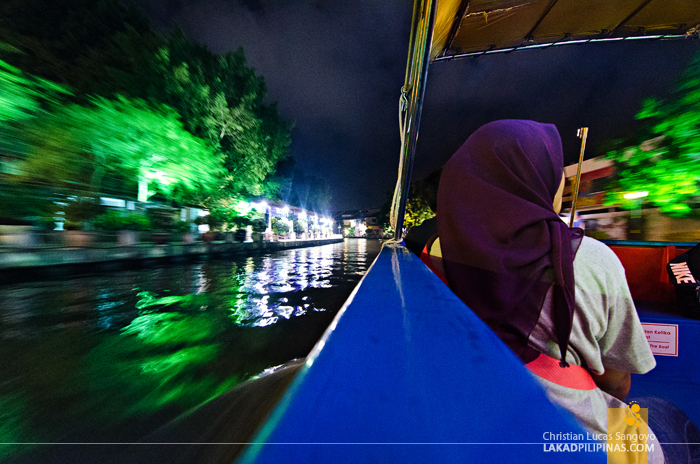 Soon, our boat was making a U-turn on a wide area of the Melaka River. We were going back just as I was enjoying the cruise. Oh well, I guess it’s a good thing as I’ll get to see those areas I missed on our first pass. And this time, I’d be glued to what our guide was saying, which has an English translation after all. Yes, thank-you for the recommendation. An interesting ride when my team from http://www.laundrycares.com/ visited Melaka during our company retreat.It gives us a good overview on the Melaka settlement. 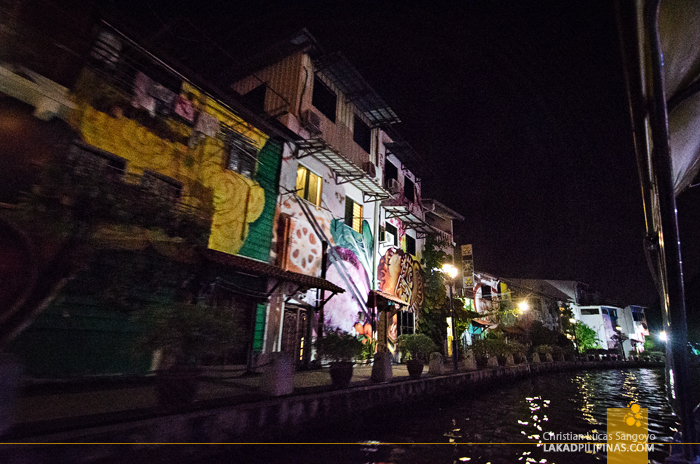 Good to hear you enjoyed Melaka!